December 14th marks the anniversary of the 47 samurai heroes who took revenge in the most spectacular and unexpected fashion on the death of their lord in the Edo period. As the story goes, a group of samurai was left leaderless (becoming ronin) after their daimyo (feudal lord) Asano Naganori was compelled to commit seppuku (ritual suicide) for assaulting a court official named Kira Yoshinaka, who had unfairly provoked him. Instead of avenging their master immediately after his death, the ronin bode their time to ensure their attack would be successful. If they had attacked Kira right after Asano’s death, the ronin would likely have suffered defeat, as Kira was ready for a hit at that time. So, Oishi Yoshio, the leader of the samurai group, hatched a plan to throw Kira off and trick him into letting his guard down. His men dispersed and became tradesmen and monks while Oishi took up residence in Kyoto and began to frequent brothels and taverns as if nothing were further from his mind than revenge. Then, more than a year later, when Oishi was sure that Kira was thoroughly off his guard, he left Kyoto and the entire band of 47 ronin gathered at a secret meeting place in Edo to renew their oaths. Then, on the 14th day of the 12th month in 1703, Oishi and the other ronin attacked Kira’s mansion in Edo according to a carefully laid-out plan, killing Kira, and finally avenging their master’s honor. In turn, they were themselves obliged to commit seppuku for defying the shogunate’s authority by exacting revenge, which had been prohibited. They all committed seppuku and died honorably on the same day. 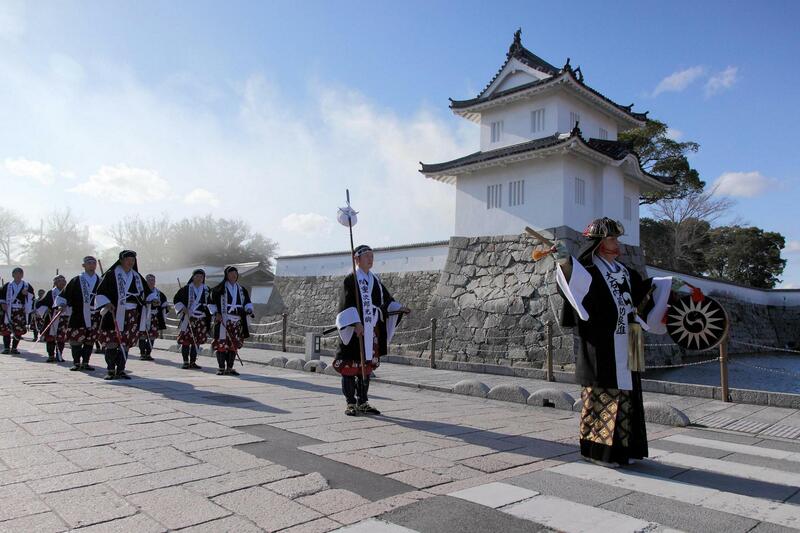 This is a much-loved national legend and hordes of people flock to the hometown of these heroes—the small Seto seaside town of Ako in Hyogo Prefecture—during Ako Gishisai (the 47 ronin festival) held to pay tribute to the great achievement of the samurai group. There is a grand parade featuring characters from this period in elegant costumes, and reenactments of combat scenes from the day of the attack. The renowned actor Hideki Takahashi will join this year’s parade to play Oishi.